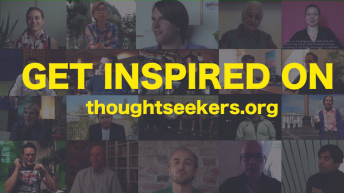 thoughtSeekers is a video motivational platform where individuals with outstanding attitudes and incredible achievements are being featured in short videos. A journey? A filming story? Or an adventure? A little bit of all three. And for sure a bit of something else: the belief that the world can spin in the right direction only as long as its inhabitants concentrate on the positive changes rather than on the diametric. Three young adventurers, Andreas Walder, Peter Henöckl and Simion Hurghis, will set out from Vienna, Austria, on multiple ventures in order to recover the world’s truest treasure, the human spirit. Armed with nothing but their individuality, indomitable spirit and motorbikes, the trio, who call themselves thoughtSeeker, will travel across continents in order to bring to you a project which aspires to become the world´s largest motivational platform: the thoughtSeeker project. Using their main tools; the Internet, their wide network of international friends and supporters and their enthusiasm, Andreas, Peter and Simion have created an online video platform where a tidal wave of individual motivations, ideas and immovable spirits of people who have a meaningful impact in their communities are featured. The theme can be a challenge that the featured speakers successfully undertook, a project oriented towards the community or simply an entrepreneurial endeavor. Anybody can access the platform and explore these inspirational videos of people with outstanding attitudes. The unique aspect of all this is, the videos in general are realized during motorbike expeditions across different parts of the world within different cultures. The filming material will be transported along and the stops overnight are very often plain fields under the free night sky. When asked about the interviewees they will capture on film, the thoughtSeeker team replies “It is not the size or the impact dimensions of the project, but rather the attitude, motivation and beliefs of the one who implemented them. We ride in order to find out what motivates our speakers and post their maximum 100 seconds in length speeches on the video platform.” shares the thoughtSeeker team. The platform promises to engage individuals who support the thoughtSeeker team from their homes, by virtually following and guessing the traces of the team during the expeditions, the more accurate the guesses, the higher the chance of winning prizes. Like us on Facebook and follow us on Youtube in order to stay up4date with the future relases.